It is with pain mingled with nostalgia that I recall those times. Hard to believe that I was once part of that swinging generation that seemed like just one endless springtime. JS was not just a mag. To us, who were in Kolkata at that time, it was a city come alive all of a sudden. It was role model for us teenagers; it was a way of life. If you look back on the 70s, that was the time that produced some of the most swinging, melodious, English songs as well - Boney M, Abbas, George Baker selection John Denver and Glen Campbell's Rhinestone cowboy, etc. And that is the heady mix that Amitabh, who is of my generation is talking about. It was a time for experimenting. To try the sherry and the cigarette, to try the jingle and the hop, to collect lyrics, to exchange books, to dance wildly on impromptu dance floors. We lived then in the Airport area in Kolkata. And Saturday evening meant hopping from one foot to another and then making a grab for the JS copy. Wondering if the cover or the poster was good. It was the huge, life-size Bruce Lee poster in the hall that scared me every night in the moonlight. It was my mother's despair as my brother went into wearing floral printed shirts and cut his pants up to add patches and my sister cut her hair. It was checking to see if Zeenat Aman really did solve our emotional problems. Trying out Simi's beauty therapies. It was all those odd names, Jug Suraiya ....now I do not know why but that name stands out when you think of JS. 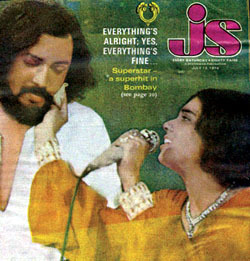 JS was not just a mag. They made certain places in the city and certain hangouts their own. Thus, JS meant the vintage car rallies and carnival time. It meant dancing to Daddy Cool on the vibrating wooden floors of the Jean Junction on Lindsay street while a gooly wooly who looked like part of the Boney M group took your orders. It was the watchword in fashion. It meant certain people were in. The suave Victor Banerjee, and the debonair Aparna Sen. And our own beautiful girl next door - Nafisa Ali. JS was exchanging "love is" notes and squealing over David Bowie. It was the top of the charts. It was some music shops - not others. It was for us teenagers also the reason why we hung around The Statesman office waiting to see - what? All those ingredients of the witch's brew walk in and out. We truly believe that a continuous carnival went on inside that staid building. And it was sending Ramesh Rangan, DJ for Yuvavani, Kolkata and our good friend, to get us the inside story. How did the Osibisa look like in person, what did they eat? Which is how we knew months before it was wrapped up, that it was going to be. My eyes mist over even now as a colorful city went back to black and white. On a personal note, Ramesh Rangan too died a year later. He was drowned in a lake.